August 20, 2010, Mt Rainier Fryingpan or Paradise? With the forecast showing Friday to be the last nice day before an incoming system brought clouds and rain for the weekend, I figured I should get out and ski again. 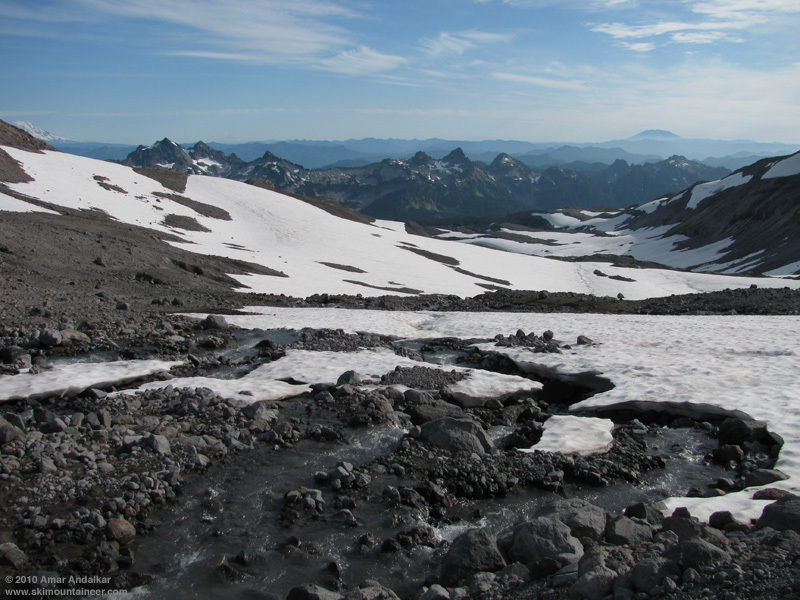 Since I'd been going to either Mount Baker or the Paradise Glacier on every ski trip for the last month, how about the Fryingpan Glacier for variety? 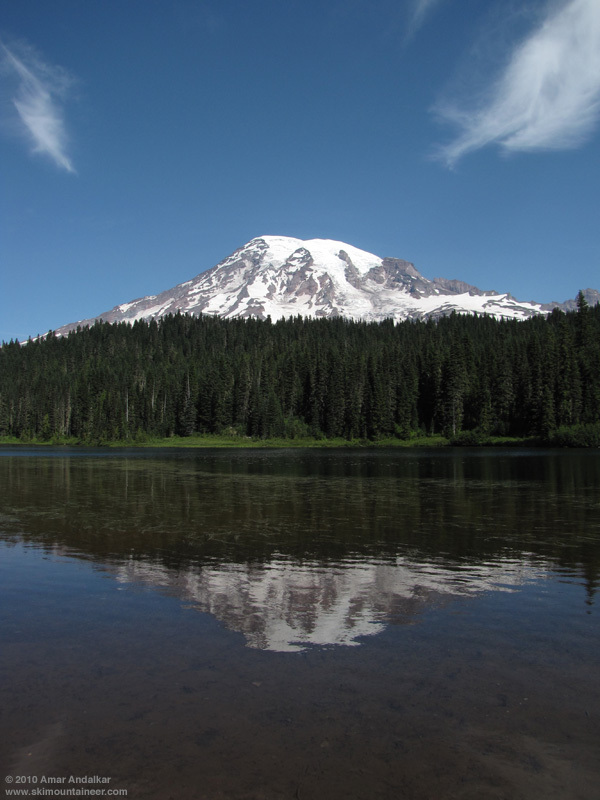 There were no recent reports since August 1, but conditions had been good then and might still be so, since the Fryingpan often stays smoother and less suncupped than other Rainier glaciers in mid-summer. That was the plan as I drove down from Seattle, but near White River I realized that I was still tired from skiing Baker 2 days earlier (August 18, Easton & Squak Glaciers), and just didn't want to do a long approach with skis and boots on the pack. I could get the same quality and quantity of skiing on the Paradise Glacier as the Fryingpan, but with much less hiking. Both would offer about 3000 vert of skiing in the roughly 6200-9200 ft range, but no more than 2000 of it would be continuous without carrying over bare sections, and the hike to reach snow was probably now almost 5 miles for Fryingpan versus about 1.8 miles for Paradise Glacier. Took a long look at the Fryingpan from the viewpoint on SR 410 and saw a few sections of bare ice starting to show near 9000 ft, but crevasses still looked minimal from this distance. Hard to tell if the snow is still smooth or not, even with a 560mm zoom. 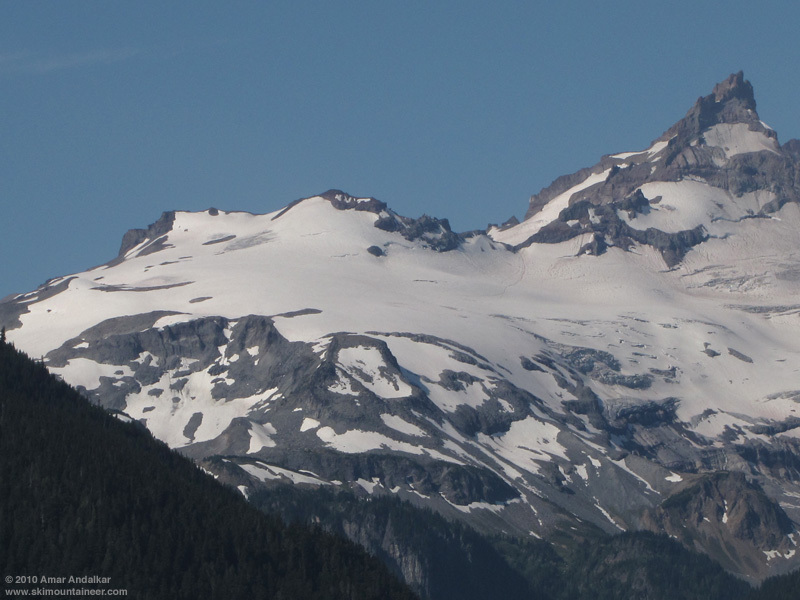 So onward to Paradise instead via the scenic route, getting some nice views of the entire Paradise Glacier and Muir Snowfield area from viewpoints along Stevens Canyon Road. The last snow connection from Paradise Glacier to Muir Snowfield has melted off since my previous trip on August 11 (see TR), but otherwise the glacier looked good from a distance. Headed up the 4th Crossing Trail at 11:30am, a beautiful sunny day with wispy cirrus clouds, but quite cool despite the 12000 ft freezing level. Reached skinnable snow at 6250 ft on the Paradise Glacier Trail, same as before. 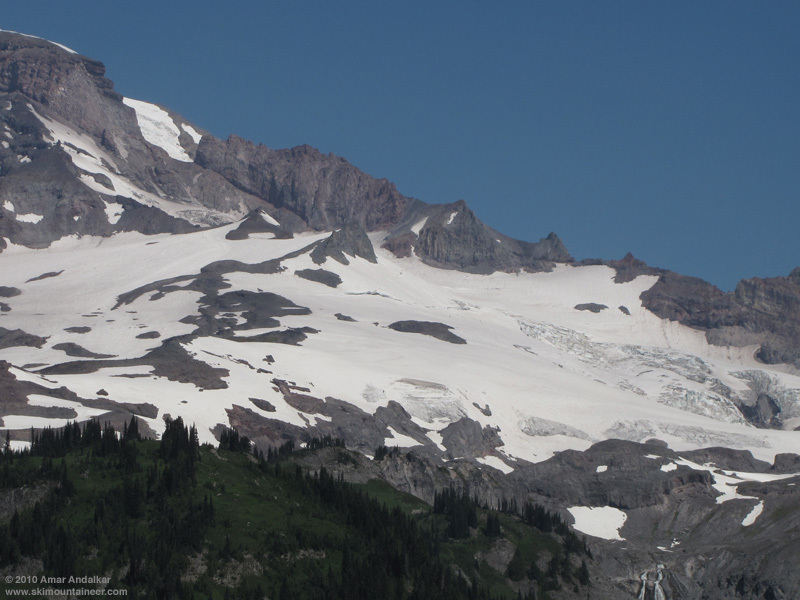 However, the recent heat wave has done some serious damage to the snowpack in the lower basin beyond that, with several carries now needed across bare sections to reach continuous snow at 7100 ft just below the toe of the glacier (3 to 5 carries, depending on one's tolerance for all-terrain skinning and skiing). In addition, subniveal meltwater streams have turned the remaining snowfields into minefields of hazardous hidden caves, often thinly bridged and hard to avoid punching through while crossing -- the ghosts of the vanished Paradise Ice Caves are taking their revenge. Safety should improve after more heat and sun melt the remaining snowpack, and the whole approach turns into a hike all the way to 7100 ft.
Bare ice and ski tracks at the terminus of Paradise Glacier. The glacier itself is still in good shape, the snow still fairly smooth and minimally suncupped, but crevasses are becoming a much greater concern. There is bare blue ice exposed along much of the glacier toe near 7200-7500 ft, along with a few sags and cracks. Lots of crevasses are opening in many areas above that too, and although most appear to be narrow enough not to swallow skiers, the risk of a crevasse fall is becoming more significant. Large and dangerous cracks are opening on steeper convex areas along the eastern edge of the glacier near 8200 ft, with thinner cracks extending across much of the glacier near this elevation. Being solo, and also completely alone with no other skiers or hikers in sight on this day, I was definitely more worried than on any prior trip up the Paradise Glacier this summer. 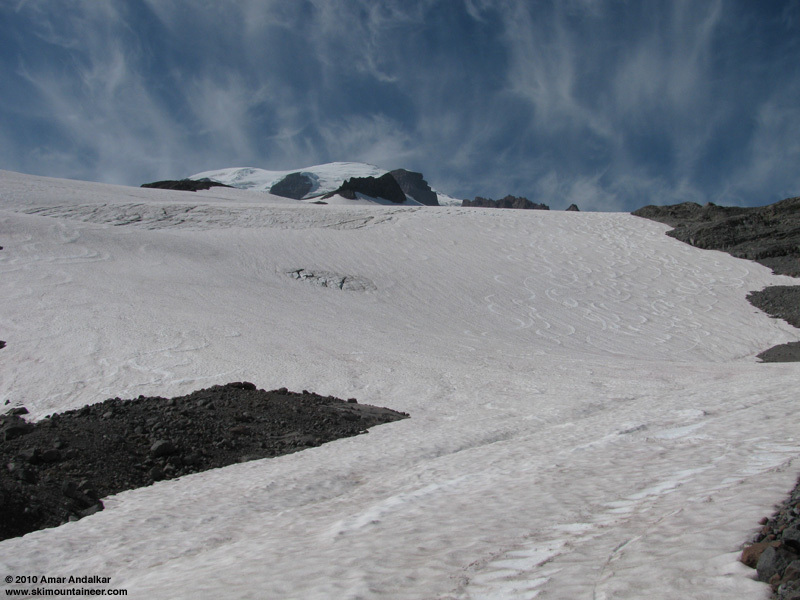 Smooth snow and ski tracks on the heart of Paradise Glacier. Skinned up to the top of the glacier at 9100 ft, where a group of climbers was digging platforms for 4 tents. The snow surface near 9000 ft seemed to be smoother than on my previous trip. Skied down at 3:30pm, on really fast and enjoyable corn, mostly smooth if avoiding the old raised ski tracks. Skied down to the end of continuous snow at 7100 ft, and despite the late hour and tired legs, I couldn't resist the urge to take another run, the snow was just too nice. Skinned back up to 9100 ft by 5pm, strangely enough making much faster progress the second time, and was soon skiing down again in identically fine conditions, another lovely run despite long shadows and dropping temperatures. All-terrain skiing skills made short work of the first stream crossing at 7100 ft.
Then a combination of skiing on snow, skiing across rocks, and carrying skis across 3 longer bare sections brought me down to the end of the skiable snow at 6200 ft by 6pm. A cool breeze was blowing across the barren deglaciated basin, and down the deserted trail back to the car by 7pm. Nice to enjoy an easy fun day and an entire glacier all to myself, with 4800 vert of mostly sweet turns for about 6000 ft of total gain, an 80% ratio that's unusually high for late August. 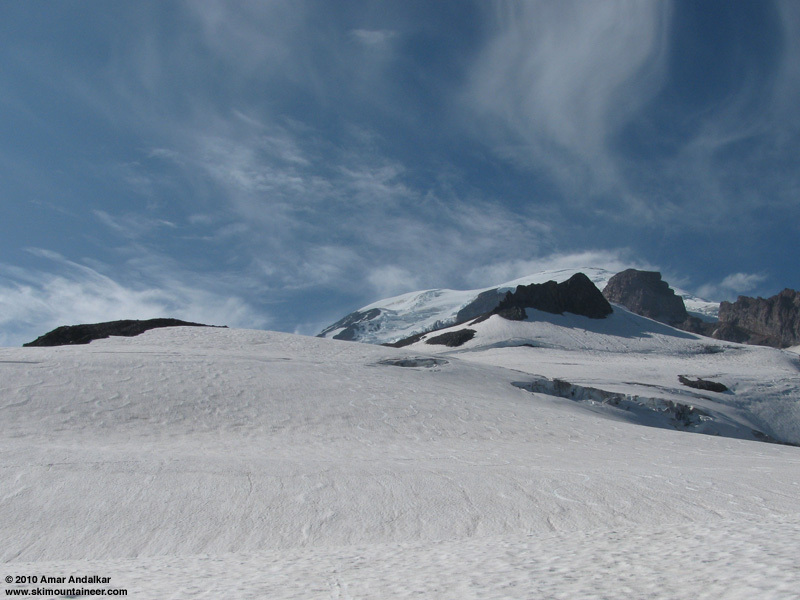 The Paradise Glacier looks like it will offer fine skiing through the rest of the month and into September, although crevasses are becoming a concern. Access from Paradise via the trail to Muir may become more efficient than starting at 4th Crossing as the snowpack in the lower basin vanishes. The Mountain mirrored in Reflection Lake, earlier that day. SYNOPSIS...AN UPPER TROUGH WILL DEVELOP AND MOVE THROUGH THE REGION THIS WEEKEND. A WEAK SURFACE TROUGH OR COLD FRONT WILL MOVE THROUGH WESTERN WASHINGTON AROUND DAYBREAK SUNDAY. ONSHORE FLOW WILL PERSIST AND DAYTIME TEMPERATURES WILL CONTINUE TO RUN BELOW NORMAL THROUGH THIS WEEKEND. HIGH PRESSURE WILL BUILD MONDAY. FRIDAY...MOSTLY SUNNY. FREEZING LEVEL 12000 FEET. FRIDAY NIGHT...PARTLY CLOUDY. FREEZING LEVEL 10000 FEET. SATURDAY...PARTLY SUNNY. FREEZING LEVEL 10000 FEET. SATURDAY NIGHT...MOSTLY CLOUDY. A CHANCE OF SHOWERS AFTER MIDNIGHT. SNOW LEVEL 8000 FEET. SUNDAY...MOSTLY CLOUDY WITH A CHANCE OF SHOWERS. SNOW LEVEL 7000 FEET. SUNDAY NIGHT...MOSTLY CLOUDY. A CHANCE OF SHOWERS IN THE EVENING. SNOW LEVEL 7000 FEET. MONDAY...MOSTLY SUNNY. FREEZING LEVEL 10000 FEET. MONDAY NIGHT...PARTLY CLOUDY. FREEZING LEVEL 11000 FEET. TUESDAY NIGHT...PARTLY CLOUDY. FREEZING LEVEL 11000 FEET. WEDNESDAY AND WEDNESDAY NIGHT...PARTLY CLOUDY. A CHANCE OF SHOWERS. SNOW LEVEL 9000 FEET. Re: August 20, 2010, Mt Rainier Fryingpan or Paradise?